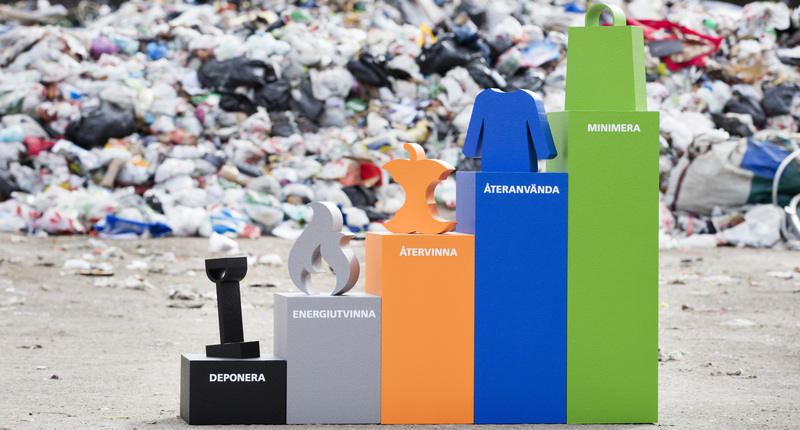 To achieve the best possible waste management, VafabMiljö works according to the Waste hierarchy. It is an EU directive that describes how the waste should be disposed of in the best way for the Environment. Waste hierarchy consists of five levels that gradually describes how waste should be managed and treated. The top step that we strive for is to reduce waste by preventing the creation of waste. On top of the waste hierarchy and the best for the environment is to try to prevent the waste generated. Today we use more resources than the earth can produce which is not sustainable. We need to become more resource efficient and reduce our environmental impact. This can be done both by the producers, that can develop better production and more durable products. But also if we can change our patterns of consumption and become more aware of how we affect the environment when we buy new things. Reusing products is one step better than recycling because we can repair, give away or sell things we no longer have need of. Second-hand and other things that´s been used is really good for the environment because we do not need to take any new resources from the earth. There are other examples of re-use, such as borrowing books from the library, rent or borrow things rather than buy your own. If we can not re-use the goal is to recycle materials as much as possible. The reason that recycling is good and important is because we can save a lot of earth´s resources. When we recycle we also saves a lot of energy compared to the production of new material. The materials that can not be recycled is burned in incinerators, where the energy of the materials is extracted as electricity and heat. It is the residual waste that can not be sorted out for recycling that goes to energy recovery. If the waste can not be disposed of in any other way then the last step will be landfilling. It is the worst option because since the waste can not be used as a resource.